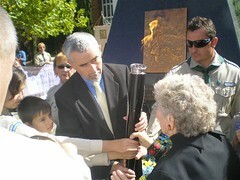 Canberra became the international focus on April 6, 2008 when the International Torch Relay – Remembrance Flame was lit by Mr Stefan Romaniw, Chairman of the Australian Federation of Ukrainian Organizations and Ukrainian World Congress International Coordinating Committee of the 75 Anniversary of the Holodomor. The Flame began its journey in Australia with the historic lighting of the Flame, which was held on Sunday April 6, 2008 at 1.00 pm. 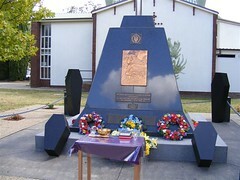 at the Holodomor Memorial St Nicholas Orthodox ChurchGrounds Mackay Gardens, Turner. Parliament Parliament, who attended with his son, Owen. Pictures from the event can be found here and here.